LG V40 Thinq Offers: LG V40 Thinq smartphone will be available from 19th January for purchase. LG V40 Thinq price in India expected to be Rs.49999. LG V40 ThinQ has been launched on Jan 19, 2019. This is 6 GB RAM / 128 GB internal storage variant of LG which is expected to available in Moroccan Blue, Platinum Gray colour. What is LG V40 ThinQ Sale Date? What is LG V40 ThinQ Price in India? LG has finally launched the much awaited flagship smartphone, the V40 ThinQ, in India. Now you should ‘Switch to the 5-Camera Phone’ with the all new LG V40 ThinQ. The new smartphone will offer you more ways to capture every story with 3D Light Effects in the camera, triple shot, wide-angle selfies, Cine Shot, super wide-angle, telephoto zoom and Google Lens feature. 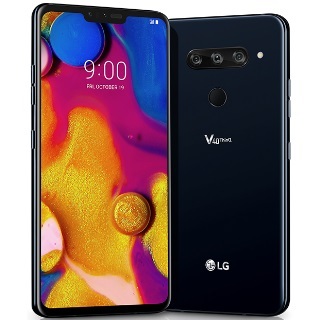 LG V40 ThinQ offers IP68 rating for water and dust resistance, Corning Gorilla Glass 5 protection on the front, back and cameras, a heat pipe for heat dissipation, and military standard shock resistance. The smartphone features a dual front camera setup, triple rear cameras, a rear fingerprint sensor, and Boombox speakers with DTS:X 3D surround sound. LG V40 ThinQ specs include a 6.4-inch QHD+ FullVision OLED notched display panel, a 2.8GHz Octa-core Qualcomm Snapdragon 845 flagship processor with Adreno 630 GPU for an immersive gaming experience, 6GB of RAM along with 128GB of UFS2.1 inbuilt storage that can be further expanded using a microSD card up to 2TB. The triple rear cameras on the LG V40 ThinQ consists of a 12MP telephoto zoom lens, a 16MP super-wide angle lens, and a 12MP standard lens along with AI camera features, OIS+ and EIS for stable video recording including 4K UHD videos. The dual front cameras include an 8MP wide angle lens and a 5MP standard lens along with selfie light support. LG V40 ThinQ packs a 3,300 mAh long lasting battery that will last a whole day of usage on a single charge, and supports Qualcomm’s Quick Charge 3.0 technology using the USB Type-C port and Wireless Charging support, too. As the smartphone is an Amazon exclusive in India, you will not be able to find any LG V40 ThinQ Flipkart offers but we will surely list all the best LG V40 ThinQ discount offers to bring down the smartphone’s price for you. The smartphone is readily available on Amazon on an open sale for purchase so you don’t need to worry about the LG V40 ThinQ next sale date. The recently launched smartphone is available with a bunch of LG V40 ThinQ Amazon offers that can definitely benefit you in making the smartphone all yours in a much lower price. LG V40 ThinQ price has been set at Rs 60,000 in India for the sole 6GB RAM variant with 64GB storage and it has been made available during the Amazon Republic Day sale. LG V40 price has been set much lower as compared to its US variant that was launched at USD 899.99 (roughly Rs 64,000). You can make use of the below mentioned LG V40 ThinQ Amazon offers that will benefit you in bringing the price down of the smartphone. The smartphone is available in two colours on Amazon - Moroccan Blue and Platinum Gray. LG V40 ThinQ is available on Amazon.in for just Rs 49,990 along with some exciting launch offers including no cost EMIs, discounts, and more. No Cost EMI available on Bajaj Finserv EMI cards, all major credit cards and select debit cards. Get one time free screen replacement worth Rs 16,750 valid for 6 months on purchase of LG V40 ThinQ from the seller Appario Retail Pvt. Ltd.
Get up to Rs 13,965 off on exchange of older smartphone. Get extra Rs 5,000 off on exchange if you buy this smartphone from the seller Appario Retail Pvt. Ltd.
You can always visit GoPaisa.com where you can get all the information about the LG V40 unlocked version too along with the LG V40 ThinQ review videos that you can check before purchasing the smartphone.